In November 2002, the United States Court of Appeals for the Fifth Circuit ruled that the Federal Wire Act prohibited the electronic transmission of information for sports betting across telecommunications lines. 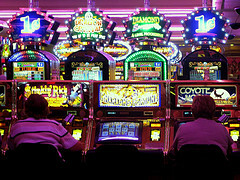 Thus, gambling laws in the States were tightened, which not only spelt bad news for the many millions of casino-loving people that were unlucky enough to live nowhere near Las Vegas, but credit card companies lost a lot of revenue too – while online casinos had to shut up shop…or start looking elsewhere to generate income, given that almost 50% of their profits were from American gamblers. Of course, where there are losers, there are normally winners too – the translation industry did exceptionally well in this case, as online casinos started looking to non-English speaking countries to make up the shortfall the US ruling had created. And a similar situation has arisen with the credit crunch too. With a number of economies entering into recession, businesses from across many industry-sectors have been forced to look for opportunities elsewhere, where things perhaps aren’t quite so bad. Or, even, where thing are actually going rather well. Indeed, the fact that the global economy has reached a somewhat stagnant state of late doesn’t mean that businesses’ growth initiatives have stuttered to a standstill too. And this is why many companies have been investing in translation services as they seek to build business relationships in new and emerging markets. German is the most commonly spoken language in the European Union (EU) with 18% of people speaking it as a mother tongue, followed by English and Italian with 13% speaking it natively. But if we take second languages into account, then English is spoken to some degree by over half the EU. English is currently the dominant language of the internet in terms of content, but over fifty percent of all Google searches are in languages other than English. This figure is likely to rise as online populations grow far quicker in foreign language-speaking emerging markets such as China and Russia, than in the west. Furthermore, over 70% of the world’s population don’t speak English to any degree. In the open-all-hours age of the internet, language is one of the last remaining barriers left in creating a true global village. As such, translation is certainly one of the safer professions to be in. What a translator earns depends on many factors. As with any profession, their experience will dictate how much they can charge. But their subject-specific experience will also dictate how much they will earn. For highly technical texts such as pharmaceutical or medical documents, a translator must have in-depth knowledge of this field. Indeed, often a translator will have an additional qualification in a particular subject area, meaning they are fully in tune with the relevant terminology. Furthermore, the language they are translating from will dictate their fees. If it’s a rare language combination, such as Swahili to German, then this will command a lot more than English to German, simply because there are far fewer translators with this skill-set. Most translators charge per 1,000 words and the fee they command can differ greatly depending on the above factors. A rough ballpark figure would be anywhere between $60 and $90 per 1,000 words, though it can be more or less than this. Subsequently, how much a translator earns in a year will vary greatly. Many linguists work part-time, flexible hours; some work twelve hours a day. For dedicated linguists at the top of their game, it may be possible to earn well in excess of $70,000 per year, whilst those who are simply looking for some extra spending money will be happy with a fraction of that. So how does one become a professional translator? Well, assuming you’ve studied another language and are ‘fluent’ in a foreign tongue, you are in a fairly strong starting position. But contrary to what many people think this – in itself – isn’t enough. To provide convincing translations, you need in-depth, first-hand knowledge of the culture of the source language which is why any translator, English or otherwise, should only ever translate INTO their native language from a language in which they are fluent. Language fluency is a necessary but not sufficient condition for successful employment as a translator. There are a number of courses available for those who wish to become qualified translators and most countries will have their own professional bodies offering a similar level of certification. It’s worth contacting the ATA in the US for further information, which is the American Translators Association. Having done all the hard work, and passed your exams, you need to know what to expect from a career as a professional translator. Given the fluctuating demands for language combinations, most translation companies only have a handful of in-house translators covering the most common language combinations, which means that the vast majority of translators work on a freelance basis. From a lifestyle point of view, this is great as you have the freedom to work where you want, when you want and for whom you want. All you really need is a networked computer, email address and you’re good to go. More than half of Lingo24’s translators earn income from sources other than translation – some are teachers, writers or accountants, others are secretaries, IT consultants or lawyers. Many are full-time parents too, and translation offers the perfect, flexible part-time position to fit in with their other commitments. So if you like being your own boss and having the freedom to pick and choose who you work for, how much work you do and how often, then freelance translation is the way to go. And as far as job security is concerned, there are few safer professions. Christian Arno is the founder and Managing Director of global translation services provider and localization specialists Lingo24. Launched in 2001, Lingo24 now has over a hundred employees spanning four continents and clients in over sixty countries. In the past twelve months, they have translated over thirty million words for businesses in every industry sector and their turnover in 2009 was $6m USD. Christian has written 1 article(s) for JuniorBiz.com.